When Capt. Ed Ewing's fishing boat, the South Bay, pulls up to the dock to unload thousands of pounds of freshly caught local fish, the whole Morro Bay waterfront seems to hum in harmony. After years of discord, all the players are pulling together to keep the local fishing fleet from sailing over the brink of extinction. FISH HARVESTER : Capt. Ed Ewing of the South Bay is using a more environmentally friendly trawl net to bring in local rockfish, flounder, and sole, in cooperation with conservation groups. # Longtime local fishermen like Ewing have been feeling the squeeze of ever-increasing regulations and gear restrictions, cutbacks in quotas, catch limits, and new marine protected areas. Landings of seafood at Morro Bay and Port San Luis have dropped from 14 million pounds in 1990 to 1.2 million pounds in 2006, with a corresponding decline in the economies of the two fishing communities. The threat of a total collapse of the local industry has inspired a bold new approach, where instead of wrangling, fishermen are working alongside conservation groups, scientists, and local officials to preserve the local fishing heritage, protect marine resources, and keep local seafood on local dining tables. The South Bay's full hold of fish is a gleaming testimony to the new spirit of cooperation. In the wake of the South Bay's success, federal regulators have approved an even bolder experiment for the Morro Bay and Port San Luis fishing industry: Decisions about locally resident fish stocks will be made not by individual fishermen, not by federal regulators, but by a local committee. Six local fishermen will be selected by an unaffiliated committee of local business leaders in the coming weeks to take part in the new collaboration, which also involves combining into a shared pool the currently unused catch limits from the trawl permits purchased from local fishermen by The Nature Conservancy and Environmental Defense Fund in 2006. Rather than using trawl nets, the fishermen will switch to fishing gear that targets individual species, such as hook-and-line and traps. WILD-CAUGHT LOCAL FISH : Demand is increasing for sustainably harvested seafood from local waters. A new cooperative approach is expected to increase supplies. # "It's an unlikely partnership. We're on the cutting edge, on the whole West Coast. It's exciting. People are looking at Morro Bay as a living laboratory," said Michael Bell, The Nature Conservancy's marine project manager for the Central Coast. "We're hoping to create something that benefits all. We need to take a different path, because the old path hasn't worked for fishermen or the harbor. There's a demand for all of us to work together to find answers," added Morro Bay Harbor Director Rick Algert. According to the president of the Morro Bay Commercial Fishermen's Organization, Jeremiah O'Brien, "The longer we work together, the more understanding we get. But we weren't always holding hands." For example, conservation groups including The Nature Conservancy supported the establishment of the new marine reserves recently established in state waters offshore from SLO County, a move opposed by fishermen. Still, O'Brien said he's optimistic that the new collaboration will bring positive results for local fishermen. The concept has captured the attention of Congresswoman Lois Capps, whose support--along with the testimony of the various partners--helped convince the Pacific Fisheries Management Council to approve the innovative plan. Congresswoman Capps is scheduled to visit Morro Bay's waterfront to learn more about the novel approach on March 27. Fishermen's organization president O'Brien, The Nature Conservancy's Bell, and Harbor Director Algert talked about the innovative partnership recently over a seafood lunch outdoors on the Morro Bay waterfront, their plates filled with fresh fish caught by Capt. Ewing. The local rockfish they ate was caught with experimental fishing gear on the South Bay--namely a lighter weight trawl net designed to avoid damaging the sea floor while harvesting abundant species. The Nature Conservancy and Ewing worked together to convince federal regulators to allow the experiment under an official Conservation Fishing Agreement. Ewing's successful catches over the last few months have revitalized the local seafood industry, as fillets of fresh local rockfish, sole, and flounder have been featured at local restaurants and independent grocery stores. CONSERVING THE RESOURCES : Michael Bell of The Nature Conservancy is working with local fishermen on a new model for managing and harvesting local fish in a sustainable way for the environment, the community, and the fishing industry. # The South Bay is the only trawler still working in local waters, following a buyout of SLO County fishermen's trawl permits and trawl boats by The Nature Conservancy and Environmental Defense Fund in 2006. "It is exciting to see fish coming across the dock as part of a sustainable effort," Bell said. "Morro Bay is the epicenter of a changing model, a model that's more sustainable for the marine resources, the community, and the fishing industry." Ewing said his partnership with The Nature Conservancy is "working well so far," adding, "I haven't caught any endangered species." Of the 80-plus species of locally dwelling fish--known by fishermen as groundfish not because they live on the ground, but because they spend their whole lives within the same fishing grounds, rather than moving around like albacore or salmon do--a handful of species is considered overfished and therefore endangered. "This is testing a new business model, with lower volumes of fish and higher prices--the opposite of the traditional trawl model where high volumes of fish are sold at a lesser value," Bell said. 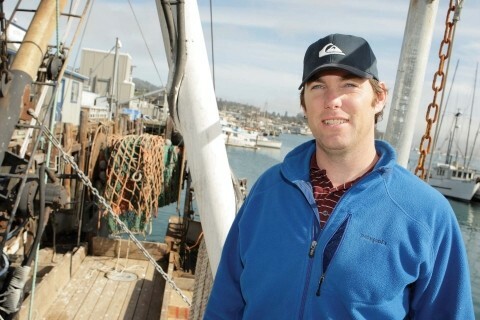 The decision-making committee, known as a community-based fishing organization, will be made up of commercial fishermen from Morro Bay and Port San Luis, the harbor directors of the two ports, and representatives from the California Department of Fish and Game, The Nature Conservancy, and Environmental Defense Fund. Rather than being governed by federal regulators whose decisions about the fisheries are West Coast-wide, the idea is that the still-abundant fish that make their home in Central Coast waters would be caught by Central Coast fishermen for local consumers, under a local decision-making structure. "We're still crafting the structure of the community-based fishing organization," said Algert, the Morro Bay harbor director. "We're putting bones on it now. There's a lot of experimenting, but there's real potential for the future, to keep the harbor active and the businesses healthy." Bell admits that the independent nature of most fishermen is "one of the biggest challenges" with the new decision-making group, adding, "If it works, maybe other fishing communities can do the same thing, and keep the resource healthy." Another test of the experiment's success will be whether younger people are attracted to a career in fishing. The average age of fishermen on the West Coast is older than 60, according to Algert. A number of local fishermen have applied to take part in the new experiment, according to Bell. Captain Mark Tognazzini of the Bonnie Marietta said he filled out an application, but was put off by the requirement to write an essay. He said he's not sure if the new structure will work for him, but he's willing to check it out. "In any case, I'll have more local fish to sell," said Tognazzini, who also owns a retail fish market and restaurant on Morro Bay's waterfront. O'Brien, captain of the Aguero and president of the Morro Bay Commercial Fishermen's Organization, said he hasn't applied, adding that his objective is to "promote and enhance any available opportunity for fishermen in Morro Bay." A longtime salmon fisherman, O'Brien said, "I do my own thing." With the likely closure of this year's salmon fishing season, doing his own thing now involves switching from catching salmon to live slime eels, also known as hagfish, for the Asian market. The eels, he said, are "interesting little characters" that can produce as much as five gallons of mucous. "They have ports along their sides that emit a huge amount of slime like Jell-o that sticks to everything," he said with a laugh. Interesting or not, the slime eels don't have much appeal so far to Central Coast seafood fans. 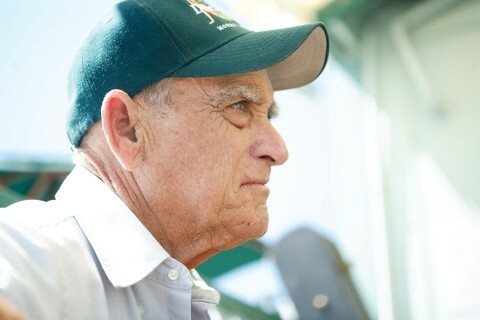 There is, however, a growing demand for locally caught fish and other seafood, according to Giovanni Comin, owner of Central Coast Seafood, an Atascadero company that buys, cuts up, and sells much of what local fishermen catch. Thanks to the fish landed by Ewing and the South Bay, Central Coast Seafood has hired more fish filleters (called "fish cutters" by fishermen) and expanded its local markets in recent months. Comin said he's been focusing on educating his customers about the sustainability of their fish. "Five years ago my customers were primarily concerned about cost. But now, the country of origin and the quality are equally important. The number of customers who prefer high quality local seafood is increasing," he said. He's asked the national Seafood Watch campaign to give the Central Coast fishery a high rating for sustainability, with a "green" rating rather than the current rating of "yellow" for local rockfish--and "red" for most foreign-caught fish. "Ideally, the end result is that the green-rated seafood will command a slightly higher price. So if you have a choice of paying $5 a pound for Canadian red snapper, or $6 a pound for local red snapper, people prefer the local fish because they know who brought it to them and where it came from." People know that buying fresh local wild seafood is a way to support the local economy as well as the environment, compared to buying seafood harvested in developing countries that may not have any regulations, he said. The new committee-based management structure for Central Coast fisheries will probably take a year or two to become a smooth-functioning system, Comin noted. "But the possibilities are very good," he added. A recently completed business plan for Morro Bay and Port San Luis commercial fisheries includes strategies for marketing local seafood. "Morro Bay/Port San Luis seafood gives consumers the chance to become part of the 'solution' of ocean conservation and the lagging economies of working waterfronts," states the business plan prepared for the California Coastal Conservancy and the city of Morro Bay. "Through targeted fishing methods, collaboration with scientists, and adherence to the strictest regulations in the world, the Morro Bay/Port San Luis product is safe--safe from excessive bycatch (waste), safe from habitat destruction, safe from overfishing, safe from hormones and antibiotics, and safe from harming other marine species," the plan reads. It notes that the new "unique partnership" between fishermen and other organizations is "sometimes controversial" in the broader fishing and conservation communities. "This alliance is unique to the West Coast, and is forging a path through a very difficult time in commercial fishing. The local fishing community is taking proactive economic and conservation measures before it is too late to preserve our local fishing businesses and working waterfronts." One possible alternative to the concept of regional management of regional resources has everybody worried: the specter of large corporate-owned vessels catching local fish, processing it on board offshore, and shipping it away, without ever coming in to shore. "The whole community loses if our fishing heritage is gone," O'Brien said. That's one reason The Nature Conservancy is working to preserve local fishermen's access to the local resource, Bell noted, adding, "Local harvesters should be considered stewards of the resource." He hopes the participating fishermen will be out catching fish under the new management model by the end of April. "We can't stamp 'sustainably caught' on every fish yet. A lot of steps are needed to revive the rockfish fishery for sustainability in the long term. Our goal is to find a harvest and management model to better protect the marine environment, to be more sustainable for the community, and to preserve local access to the resource and our fishing heritage along with it," Bell said. As for Capt. Ewing of the South Bay, he's hoping people will ask for local fish, rather than "fish that's been sitting around in a warehouse for a week in Washington." 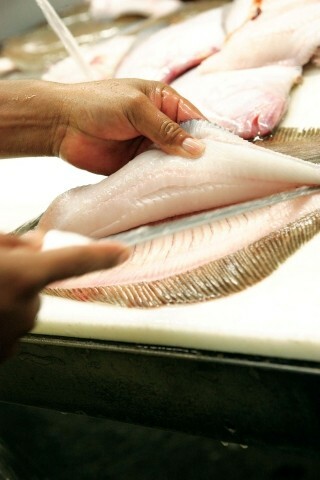 The new fish filleters at Central Coast Seafood are ready and waiting for more locally caught fish. As Comin concluded, "The outlook is very positive. I think it can work with positive outcomes for everybody."